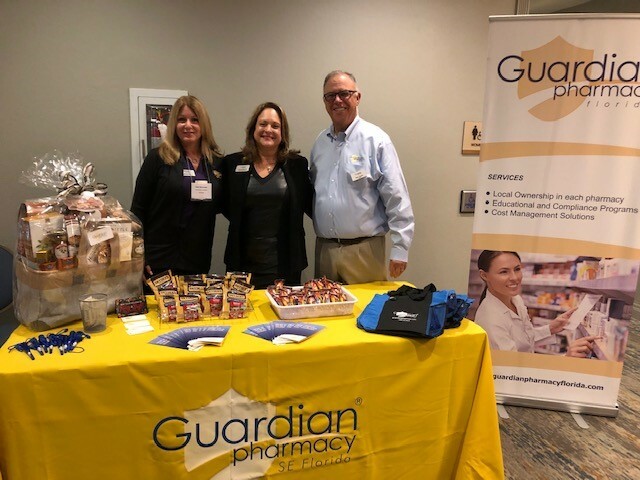 Guardian Pharmacy SEFL’s recent participation at the Florida Health Care Association’s 2019 Regional PDPM Seminars was a great success and a wonderful experience for everyone involved. “This program offered a vital educational opportunity for long-term care professionals, as well as providing a great opportunity for Guardian Pharmacy to meet and discuss our ability to serve long-term care facilities with our unparalleled programs,” said Alan Traster, Guardian Pharmacy SE FL’s president. Participating at the conference were Debi Shulman, Director of Business Development; Jacqui Moran, RN Clinical Support Specialist; and Alan Traster, President. The event, held on January 31, gave Guardian the opportunity to once again showcase its ability to serve the needs of long-term care facility patients. “Guardian Pharmacy is the preferred pharmaceutical provider in southern Florida serving long-term care facilities. We have achieved that recognition because our goal is not to just provide the very best pharmacy services possible, but to make a difference in the lives of everyone we touch,” noted Alan Traster.